Weaned on almond hulls and taco truck food while growing up in rural Northern California, I developed a passion for fitness while playing football in high school. (Un)fortunately, I also developed an affinity for food (see above). After high school, I gained a significant amount of weight, and shortly after seeing a picture of myself looking rather rotund, I decided it was time to learn how to eat and train properly. I have traveled a few different paths in my fitness journey. I first traveled the bodybuilding path and trained in this fashion for roughly five years. I began extensive research into nutrition and the best ways to achieve a lean and healthy physique. Now, I spend my days toiling in the depths of squatting, bench pressing, and deadlifting in my never-ending pursuit to lift something heavy, and set it back down. I firmly believe in becoming the strongest version of yourself you can be, while taking a sustainable and healthy approach to your dietary habits. All of the information I’ve gathered in my fitness pursuits allows me to help my clients (you!) achieve their goals. From helping turn a client into a pro bikini competitor, to helping four people qualify for World Championship Powerlifting competitions, I know I can help you achieve whatever your little (or big) heart desires. U.S. Marine Major Megan Malia Leilani McClung of Orange County, California assigned to I Marine Expeditionary Force as the Marine Corps head of public affairs for Al Anbar Province was killed on December 6, 2006, when a massive improvised explosive device (IED) destroyed McClung’s Humvee, instantly killing McClung and the other two occupants. 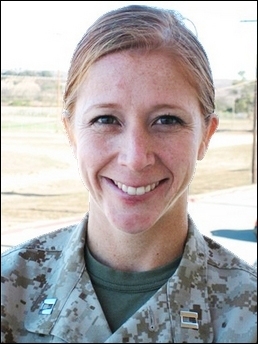 McClung was the first female Marine officer to be killed in the Iraq war, as well as the first female graduate of the United States Naval Academy to be killed in action since the school was founded in 1845. She is survived by her parents Mike and Re McClung. *1st round, 15 reps at 95 / 55 lb. 2nd round, 13 reps, 115 / 75 lb. 3rd round, 11 reps, 135 / 95 lb. 4th round, 9 reps, 155 / 115 lb. 5th round, 7 reps, 185 / 135 lb. The Victim or The Conquerer. Your Choice. Again, I'm not referring to those people. I'm referring to people from easy upbringing; no monetary concerns/issues; plenty of free time, etc. Most of you. You have no excuses.